Think about treatments as the icing and sprinkles to your already unique hand crafted Klo portfolio. Your portfolio is custom and treated with care and attention so the design implemented onto the portfolio is the ultimate cherry on top. Klo's treatments allow your portfolio to be perfectly customized and catered to YOU and only you! You'll have a piece that is 1 of 1, completely unique to your style and aesthetic. 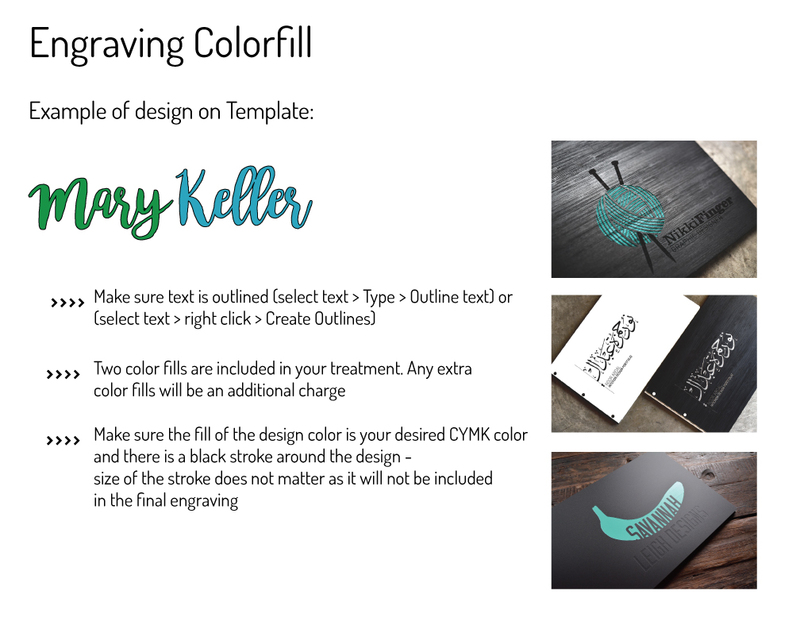 So let's begin with the various Klo treatments that can easily allow your digital designs to be a tangible, creative and visual appealing masterpiece. Engraving is essentially carving your design into the portfolio material. Think of engraving as the opposite of embossing; instead of the design being raised it will be etched or carved into the material. Engravings on our bamboo portfolio books produce a stunning look as it darkens the area that is engraved. Engraving on an ebony stained bamboo portfolio book creates a beautiful contrast since the stained bamboo is black and the engraved area reveals the natural color of the bamboo underneath. When engraved on our acrylic material, your design will remain the same color as the rest of the material although it will be finished with a clean, semi-gloss etching. The engravings on our brushed aluminum portfolios are black as the core of this material is compressed polyethylene and this is what is revealed once your design is etched. Almost the majority of designs can be engraved however the size of the design can play a significant role as the cover of your portfolio may warp if certain designs are too big due to the heat of the engraving machine. 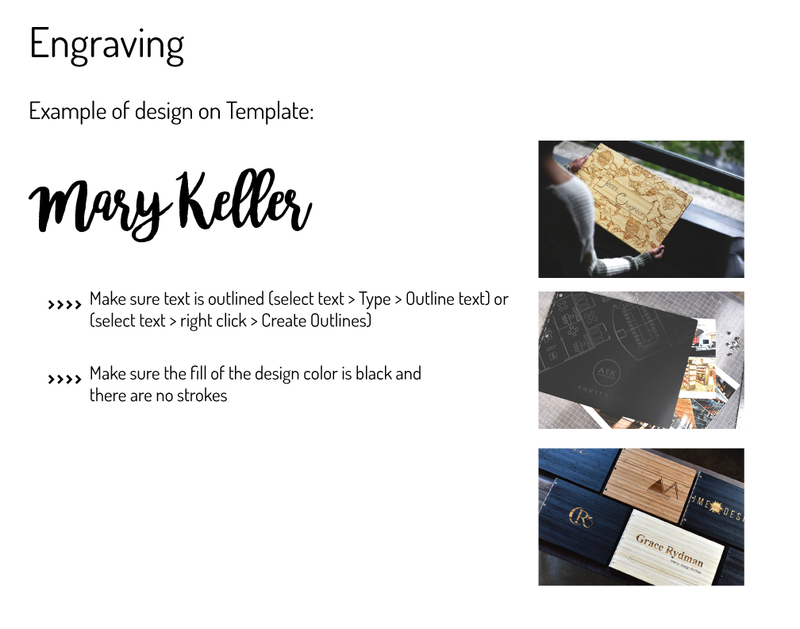 When representing a design as an engraving on your design template, all you have to do is show the engraved area in black. That's it! An engraved color fill is a two-step process where we first engrave your design, and then treat it with the color of your choice. Once your portfolio book cover is engraved, we're able to add any color imaginable, including metallic gold, silver, and copper so your screwpost portfolio really pops! With our exclusive UV Print & Cure treatment, we can color fill in virtually any CMYK color! That is a lot of colors that we offer and plenty for you to choose from. Colorfills on bamboos work better with more opaque cool colors that differ from wood tones as warm colors absorb more into the wood. Any color on the acrylics looks eye-catching, yet it all boils down to what you prefer for your brand and personally as well. 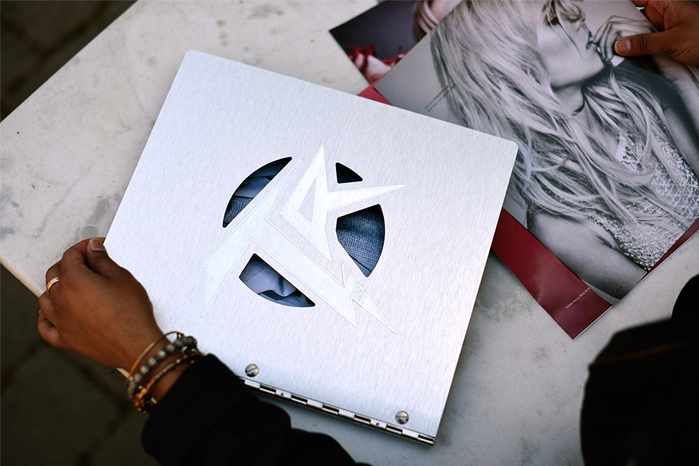 If you prefer color on your brushed aluminum portfolio book, opt for the UV Print & Cure as we don't offer engraved color fills on this option. It's important to keep in mind that the larger your engraving or engraved color fill design is on your portfolio cover, the more likely the material is likely to warp due to the heat during the engraving process. Two color fills are included in your purchase, a third color fill or more will be an additional charge. To indicate that you would like a design or text to be color filled, all you have to do is fill the design with your desired color and add a black stroke around it. Easy peasy! 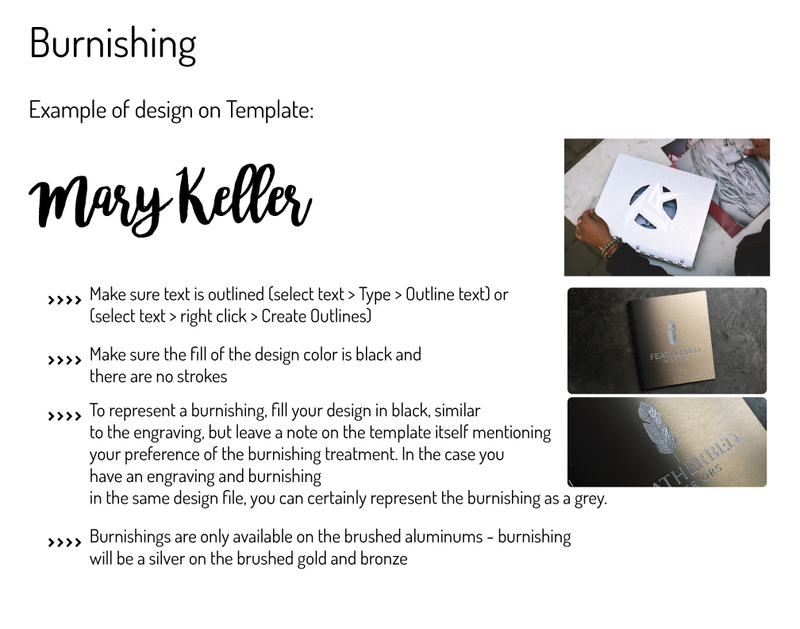 Burnishing is a treatment that is offered only on the brushed aluminum collections and is another Exclusive to Klo Portfolios. A Burnishing is a surface silver on silver etching that looks dramatic and classy all at once. Please note, the burnishing treatments on the brushed bronze and gold will appear silver on the materials as well. Burnishing a larger design area can be tricky as the treatment creates a texture that over a vast surface can showcase some minute imperfections. To represent a burnishing, fill your design in black, similar to the engraving, but leave a note on the template itself mentioning your preference of the burnishing treatment. In the case you have an engraving and burnishing in the same design file, you can represent the burnishing as a grey. Simple! Cut out treatments are in a league of their own. They offer that wow factor, especially since you can constantly alter the pages underneath allowing colors and designs to peek through the cutout, changing the look of your custom portfolio book! Cut outs are available for all the materials with the exception of the tiger bamboo as the material is very dense to cut through. As with the engraving, cut outs do have their limits as well especially if they are too big. This could leave your screwpost Klo portfolio in a fragile condition allowing for break offs in the design. Another issue that crops up with cut outs is the falling away of enclosed or interior shapes. This is more relevant in letters of the alphabet. 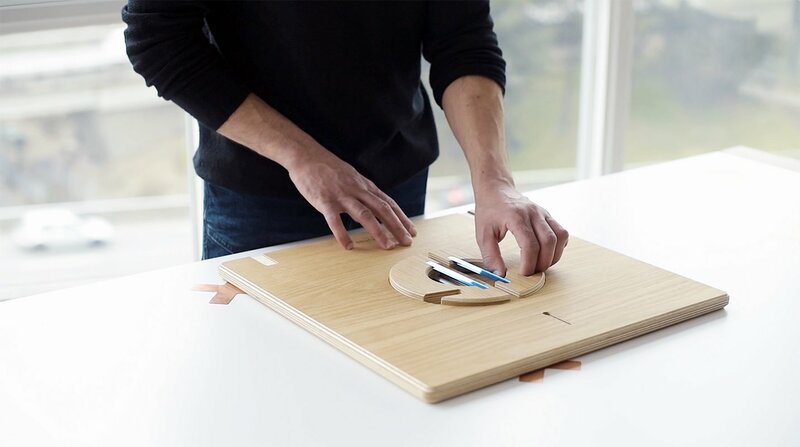 Take for example the letter R. If you wish to cut out the letter, keep in mind the interior closed shape in the R will fall away as there is no piece or break within the design linking it to the rest of the portfolio surface. Once all those hiccups have been addressed, the cut out treatment can allow for a creative and custom way to display your design. 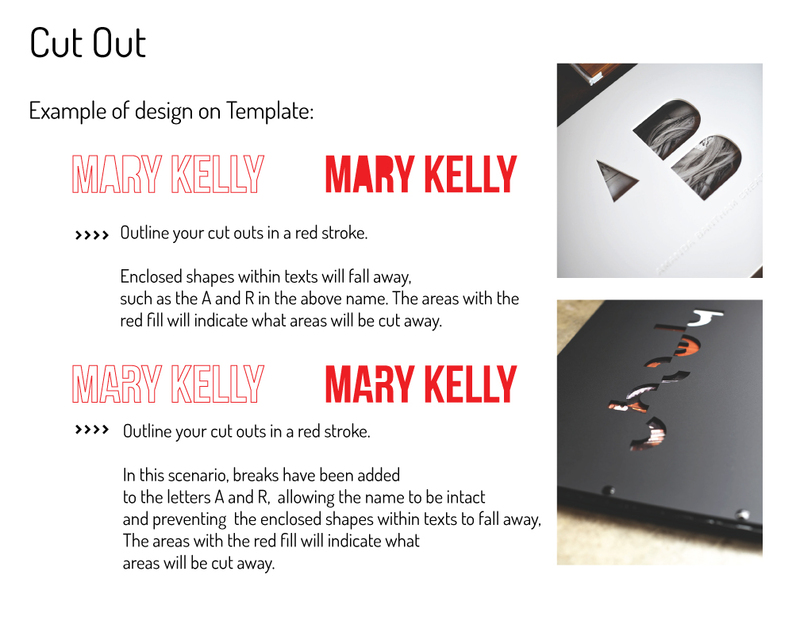 For cut outs on a template, outline your design or text in a red stroke. Boom! The UV Print & Cure treatment is exclusive to Klo Portfolios. 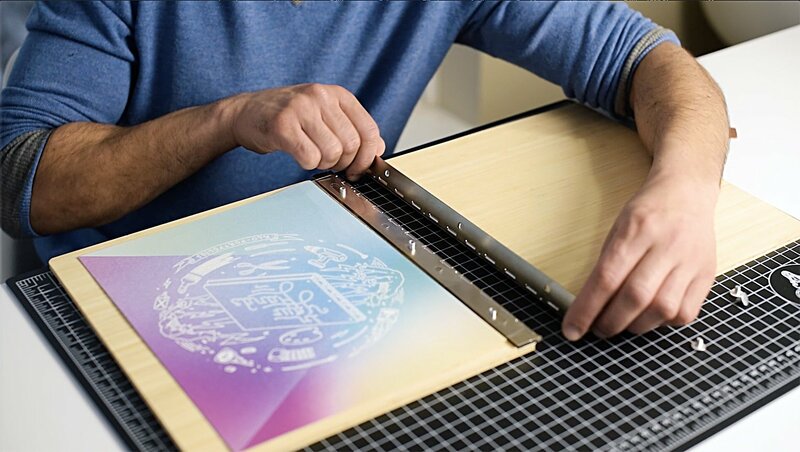 This ideal treatment allows you to print your design, pattern, or text in any CMYK color. This treatment prints and cures right away so no worries about scratching or peeling, if your screwpost portfolio is looked after appropriately. All we require for this treatment is a high resolution PNG on a transparent background with a 300dpi for perfect clarity to avoid pixelated images. If you're printing a design on a matte black acrylic, please make note that if your image is on a white background the white will print as well. Therefore, a PNG works best. The UV Print and Cure can be treated on all the materials with the exception of the glossy black acrylic, as the ink doesn't stick to the glossy material of the portfolio. 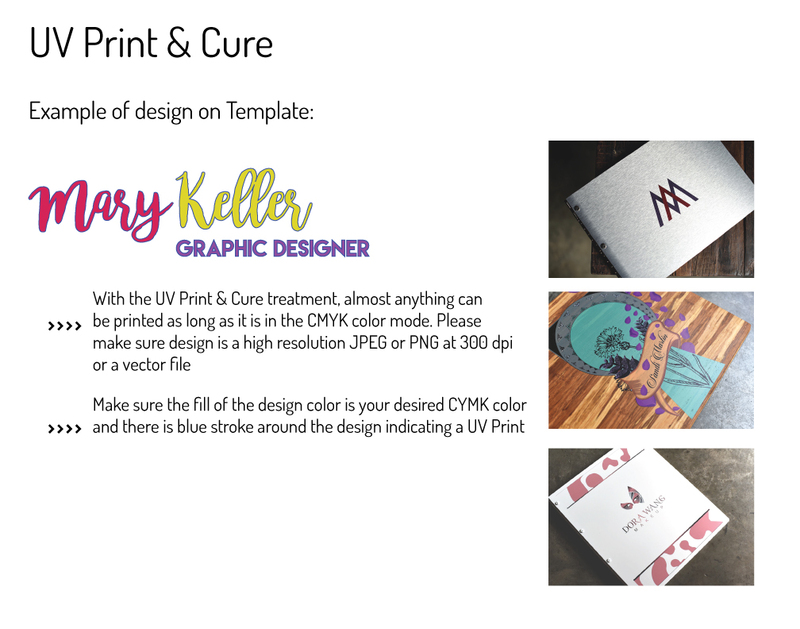 The UV Print & Cure treatment prints exactly what you send in your template, so make sure your designs are in vector format or a high resolution PNG and in the CMYK color mode. A blue stroke around your design will let us know that you would like the UV Print & Cure treatment. Ba da bing ba da boom! A treatment is included in the purchase of your custom Klo screwpost portfolio and as a bonus, the engraving and cutout does count as a single treatment. Always remember to create outlines to text so we don't lose your text style when we open your design file here. You can certainly add more treatments benefiting from all the creative options Klo offers to create a one of kind portfolio that represents you!